The temperature might reach 36 degrees today. There was enough snow overnight that the schools were closed today. 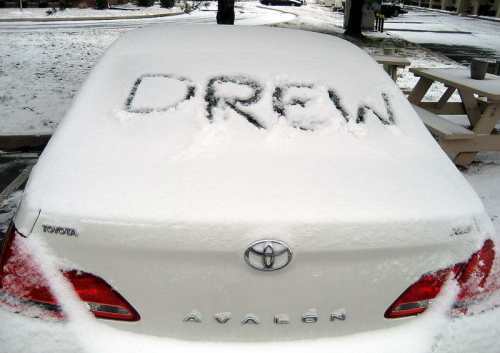 I took advantage of the back window of my rental car to do a little writing. This entry was posted in Family, Travel and tagged weather. Bookmark the permalink. You may be interested in a new tale about skiing The Zugspitze in Bavaria. Just off Scottsville Road near I-65. You have an interesting site. Thanks for the WX report. Where is the Avalon parked? I’ll check out your “Understanding Postmodernism” later. Thanks.